Josh Dolan came by today, with some plans for possible homes (and expansions to homes) for our chickens and eventually rabbits and ducks. This year, it looks like the main things we might do this year are add a second area for our chickens that's further up the slope and build the duck pond I keep talking about. Ducks don't actually need a pond to swim in, though they do need fresh water. However, we'd like to set up a place that fits their favorite lifestyle, and would like the pond to grow past the algae into a small ecology of its own. We also talked about creating tractors for the chickens, movable cages that let the chickens eat in the garden without giving them the run of the garden. These are kind of a challenge because of our irregular terrain, even after the terracing. We may make some areas more regular, or we may develop designs for tractors that can tolerate less regular terrain. One of my favorite ideas was taking some old and wobbly cedar lawn furniture and using its frame as the base for a tractor. We also talked a bit about greenhouses. Josh had a plan, suggested by a discussion in the Post-Petroleum Survival Guide and Cookbook, for a greenhouse that's strawbales on its northern side. It looks like it might make sense as both a greenhouse for growing food and as a shelter for chickens in the winter, especially if Angelika has chickens at the orchard. Sadly, I need to call a tree service to take down a dying butternut at the side of the house, but that area - which is kind of the junk zone now - is going to get some major change in the next year or so. 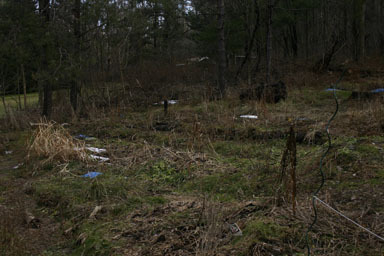 Our compost areas are going to grow, and Angelika's first few rabbit hutches may go there too. I also need to call someone about adding gutters to our new roof, and water catchment will be part of that conversation eventually. Anyone have experience with Cayuga ducks? I'm thinking about getting those, and they seem to have originated near here, so should fit the climate. Quiet and docile sound good for my first ducks as well. arrived today, from Lee Valley Tools. I first encountered this amazing Canadian company when I was starting out in woodworking. I was reading their catalog at a conference, marveling at this tool company in Upstate New York, when a friend of mine from Ottawa pointed out that they were really a Canadian company, but had a U.S. warehouse for more convenient shipping. They pretty much ensured I'd stay a customer a bit later - a few months after I'd bought a tool from them, I got a check in the mail - they'd lowered the price since and were sending me a refund! Angelika's happy to see that they list a cultivator that she's used to seeing in Germany but hadn't found in the US so far. I'm interested in some hoes I read about in the Four-Season Harvest, but I'm trying to avoid my usual tool frenzy if I can. It's also funny to me how I find tool catalogs kind of calming, even when they're huge, while I find seed catalogs overwhelming. I'm not sure what that's about. Back when we put in swales, we wondered how much water the back-most one would hold. 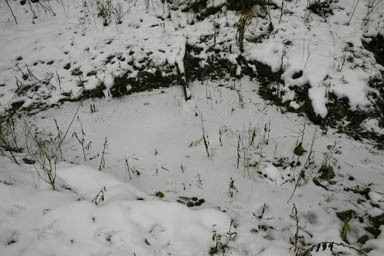 Water comes down from the hill above us, sometimes in huge quantities but often at least a trickle. It seems to stay pretty full from about November through June, though it often dries out over the summer. Right now it has water and a thin layer of ice. Last year, Josh modified it a bit, added a bit of a dam near where most of the water comes in to create a deeper ponder area and then a shallower spillway. I'm wondering whether I can make that pond a bit more permanent, holding water more tightly, and whether I can find a way to keep the water from freezing, maybe with a simple windmill. I'm not sure that holding water better is actually going to be enough to keep it from drying out in summer, but maybe. I'm also not sure that I can come up with a non-electric way of keeping some water open in winter - but again, maybe. All this time thinking and reading about the garden, and where have I gotten to? A number of these are things I hadn't tried until recently (like parsnips), or things whose values we've learned through local eating, like Bok Choi, which we can get from Finger Lakes Fresh. A few (notably the berries, wintergreen, mulberry, rhubarb, asparagus, and french sorrel) come from the hope that we can get some tasty perennials into the mix. Next step: figuring out which of these come from where, and which variety. That'll probably end up being a much nicer table instead of a list. I also get to figure out where they'll go, especially the things that need or want trellises. Between being sick over the weekend and trying to get a room painted and floored (part one complete, part two just starting), I haven't been able to do as much exciting around the garden as I'd hoped. Grow lights in the office, which is becoming a pantry. The jars above the light are tomatoes from last years' gardening efforts. The office/pantry will do for now, though in the long run I suspect we'll have to find it a new home - in part because I want to put a doorway just to the right of where the grow light is now. Eventually (next year?) I'm guessing it'll end up in the corner of the basement that holds all of the gardening tools, which is where the chickens' brooding box is right now too. It's not quite specific to the garden, but my long run hope is that the downstairs of the house will be mostly dedicated to food, with places to relax. 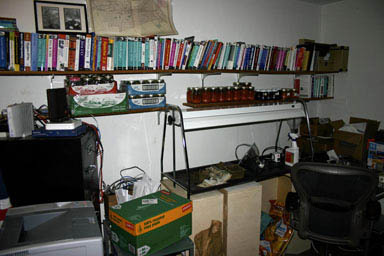 The kitchen is all about food, of course, and turning my office into a pantry will change that room. The dining room is about eating food (though it's where I'm sitting and typing right now), and the livingroom will hopefully eventually have a woodstove - the kind you can cook on. I'm guessing it'll be more than a few years before all that comes together. In addition to (finally) helping Angelika paint an upstairs room, I've spent most of this weekend exploring too many different ways of being sick. I recommend none of them, really. That's limited my garden thoughts to seed and plant catalog browsing. I'll be posting a list here of things I'm ordering when I get here, but right now the standouts are High Mowing's small red cabbages and Fedco's French Tarragon. The main problem with the seed and plant catalogs is that it's easy to get overwhelmed, even when you aren't sick. I see how people get lost in these, and I love Fedco's cover headline: "30 Years of Springtime Fiction". I'll have a lot more as I emerge. Yesterday was another day of two meetings, a bad habit I really need to break out of. I didn't manage to get to anything garden-related until (as you may have guessed from the post title) bedtime. I read Gaia's Garden again, this time exploring the chapter on animals in the garden. 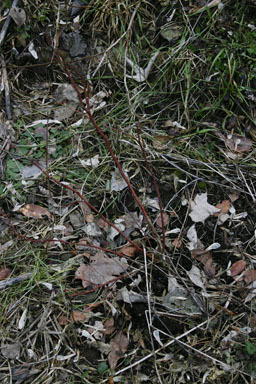 Animals here include insects - lots of them - poultry, and small mammals. He opened by watching a birdfeeder, kind of like I did the other day, and talks about moving the birdfeeder around so that all that activity can enrich different parts of the garden. I think I'll try that, especially since the area right under the birdfeeder seems to get battered after a while. Looking beyond that, though, there's a lot about planting specific flowers to attract beneficial (usually predatory) insects. Rather than trying to annihilate every insect around - which hits predators especially hard, as there are fewer of them - it makes sense to build a real food chain. The insects that bother us most are usually insects that someone else would like to eat. It's not just predatory insects, of course, but birds too. (He doesn't mention bats, but I'll finally be putting a bat box on the house to keep mosquitoes down.) There's a lot here about attracting birds, not just for their beauty, but because they have the patience to hunt bugs. Even hummingbirds eat a lot of insects! The section on rabbits might be where some of Angelika's ideas on rabbit tractors came from (it even mentions Angoras), and there's some fun stuff there about ducks and chickens as well. I ordered two packages of honeybees this morning for pickup at Betterbee on May 3rd, and I'll be ordering their hives soon too. For the last few years, though, at least half of the bees that I've noticed in the yard have been bumblebees, floating along and pollenating all kinds of flowers. I think - though I'm not sure - that there are a few underground nests in the garden area, as well as something in the woods. Apparently bumblebees are good for pollenating inside of greenhouses, and especially used for tomatoes. (There's a whole site dedicated to bumblebees.) It sounds like nest boxes aren't really necessary, and often aren't used even when they're provided. Bumblebees do make honey, but not in the great quantities honeybees produce. I'm very happy not to have found carpenter bees drilling into my house, except for a couple who decided to drill into the pressure-treated wood of my deck. I don't think they enjoyed it much, and they don't seem to have stayed. I also added a suet feeder to my birdfeeder, hoping that'll bring out some woodpeckers. I have lots of them around, but the smaller ones are fun to watch on the feeder. I did see juncos and a cardinal out today too. 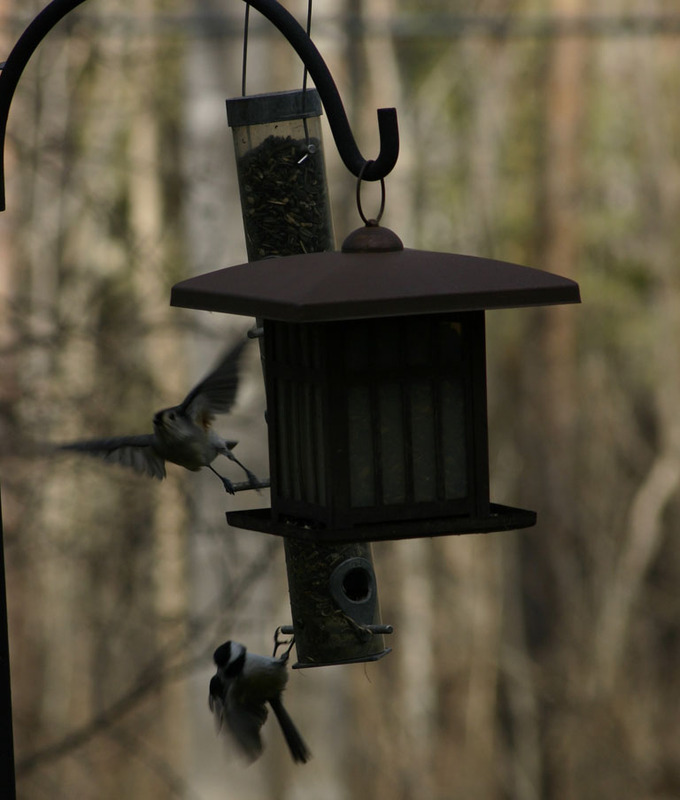 Birdfeeders seem like a classic case, though, where we supplement the natural environment to get a particular result for a little while, kind of like fertilizing plants. I'm hoping to build more bird habitat here to get beyond the artificial birdfeeding, though I definitely enjoy watching them in a concentrated space. I'm contemplating how to fit ducks into our garden. The swale at the top of our hill is pretty full of water, and often is except around August. I'm contemplating waterproofing part of the swale so it stays more pond-like, and figuring out some way to set up a little windmill to agitate the water. More generally, though, I'm reading up on ducks. Four-Season Harvest has some material on a duck tractor, but this site on backyard ducks makes me wonder if it would make more sense to keep them in a pen most of the time and let them out to explore once in a while. Our terracing makes using a tractor pretty tricky, though maybe a small one? Yesterday, I was out of the house from 8:15am to 10:30pm. I did manage to read some of Gaia's Garden, but that was pretty much the craziest non-travel day I've had in a while. Hopefully I won't have a lot more like it. Today I got to take a closer look at the garden, one last chance before it snows over the next few days. I focused on one of the further-out beds, where Josh had started some blueberries. The general idea was to have blueberries of different heights, with highbush toward the edge of the garden and low bush toward the center. (The center area is supposed to stay shorter and sunnier.) 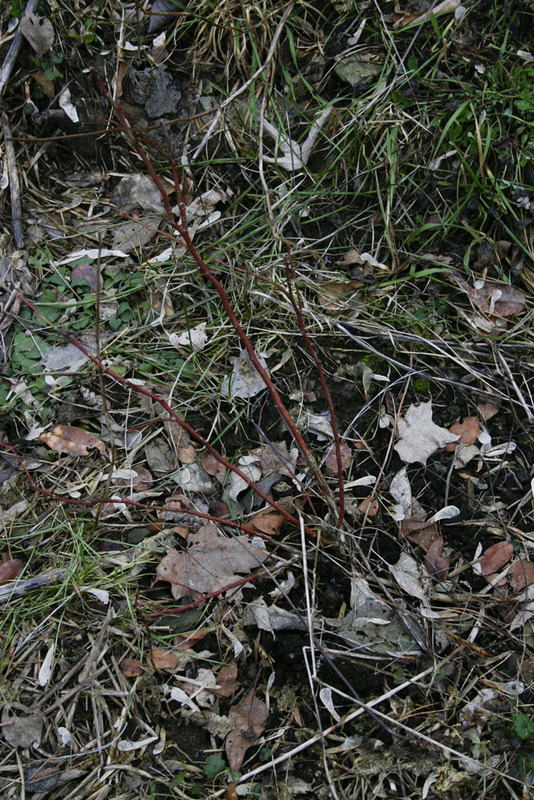 Then there'd be lingonberries underneath the blueberries, and some wintergreen as well, since they all like the acid soil my yard provides. 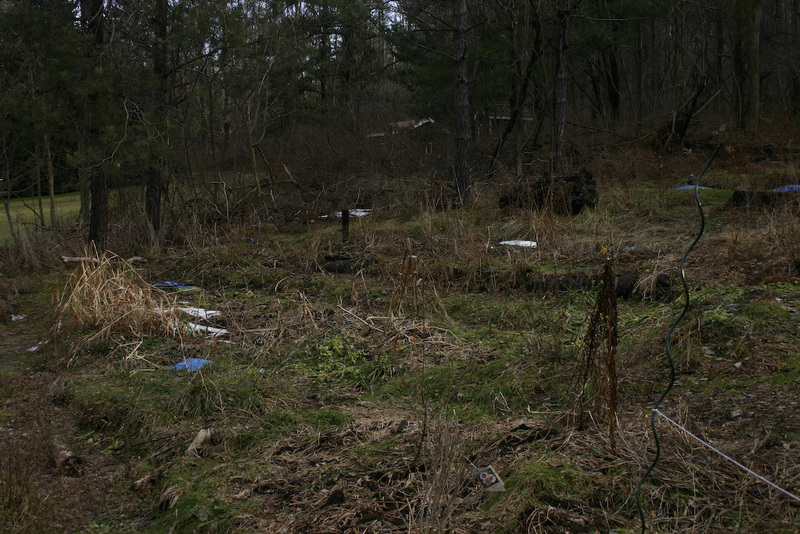 Right now, there are nine blueberry bushes out there, in varying degrees of health. 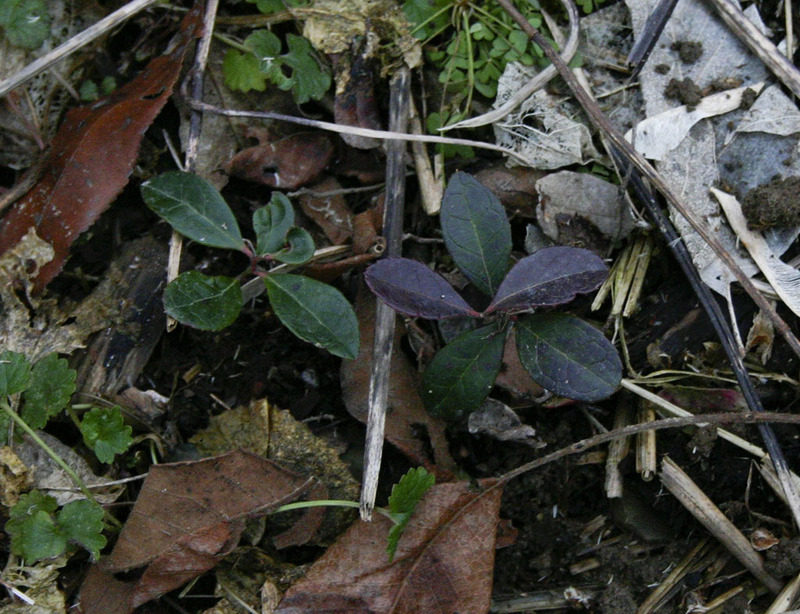 I found one wintergreen plant, and we hadn't gotten around to the lingonberries yet. I obviously didn't get to spending enough time weeding last year. The blueberries came from a number of sources - I know Oikos, I think St.Lawrence, and maybe Miller. (I obviously need to keep better notes.) One of them and the wintergreen came from The Plantsmen, just up the road here. I'm planning to add some more blueberries and wintergreen this year, and get started on the lingonberry underlayer. Obviously I need to spend a lot more time out there, but with this hour a day plan, I think that should work. 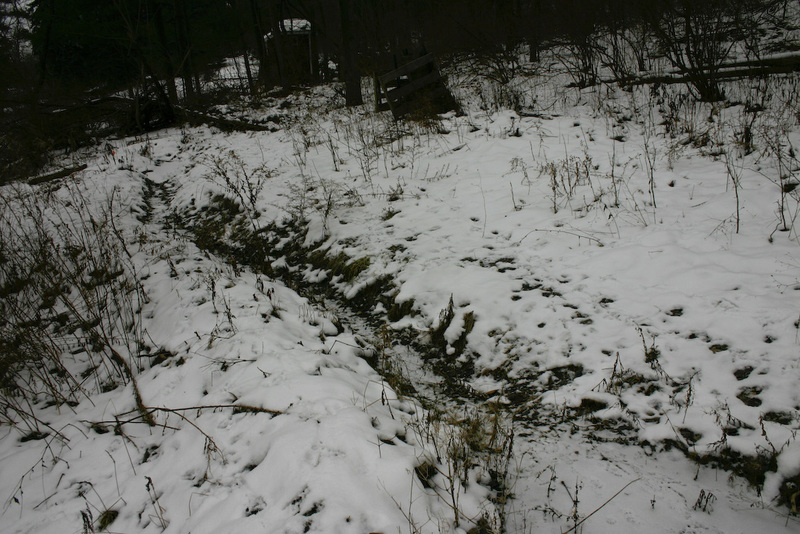 We also looked at our uppermost swale, which had a lot of water in it, and talked about cutting some of the trees at the top of the property to let more light come through to the garden below. It's also clear that I have a lot more hoeing to do to clear the paths of grass. Further up the hill, where I walked a lot less often, the mulch paths are invisible under a layer of grass that moved back across them. We looked at designating an area for a greenhouse and cold frames. The cold frames may happen this year, but the greenhouse is likely a future project. Today was exactly the kind of day I worried about when I made my resolution to spend an hour a day in the garden. Work ate most of my day, and we went out in the evening. The time I did have free I spent proofreading a transcript from an event I recorded back in October. So now, I'm sitting down to finalize our plans for getting started in beekeeping - though if anyone has suggestions, let me know - these aren't that final. It looks like we'll be ordering from Betterbee. They seem to have a good reputation, their catalog is helpful, and they're not too far away (north of Troy). I'm planning to drive over in April or May to pick up two packages of bees, so we'll have two hives. We think we're going to go with the 8-frame equipment, which is smaller and lighter than the 10-frame. We'll start with the 8-frame kit, and maybe a triangle escape board, which sounds maybe a little too magical but apparently works. We're not going to acquire honey-processing equipment at this point, hoping instead to work with other beekeepers. We'll see how that all works - it seems a bit early to worry about it! I did a bit more scuffle-hoeing of the paths, but today was colder and it was less exciting to go out. I poked around at the compost too. Most of what I really did today was re-reading Gaia's Garden, which feels different now. When I first read it, his description of yard work - in which we basically battle nature to preserve a field of green with a few select trees in it - seemed strange, and hard to reconcile with all the lawn-mowing I'd done over the years. Now that I'm trying to let plants take more control of the destiny of the place, it makes a lot more sense. Getting something useful out of a more natural approach is going to require a lot more thinking than lawn mowing ever did, and probably more work in the short run. In the long run, though, I have hopes that I'll be getting much more return on much lower investment. 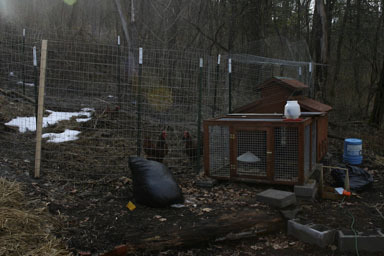 The chickens were happy today - I gave them some grapes that had sat in the refrigerator (far) too long. It's good to have happy compost accelerators that provide eggs - three today! This morning was strange - heavy winds, a sense that it was getting colder, and a forecast of rain. I decided to take care of some garden things early. Originally I planned on fixing the low-voltage lights, but that turned out to be a two-minute job, finding a connector and tightening it. I'll need to rearrange that sometime soon, either putting the connector where it won't get stepped on or rearranging things so I don't need the connector. The main thing I did was re-install the birdfeeder. I'd bought a much taller birdfeeder when the cats moved in, but it was still creating a hazard for birds when it was in range of the cats, because of the feed that fell to the ground. It fell over a while ago, and I hadn't yet found a home for it. This morning I installed it in the front yard, in the corner of a flowerbed. I put in some seed - old seed that seems to have become a strange mess of its own - and within about twenty minutes I had chickadees and titmice visiting regularly, while the cats watched the action through the window. 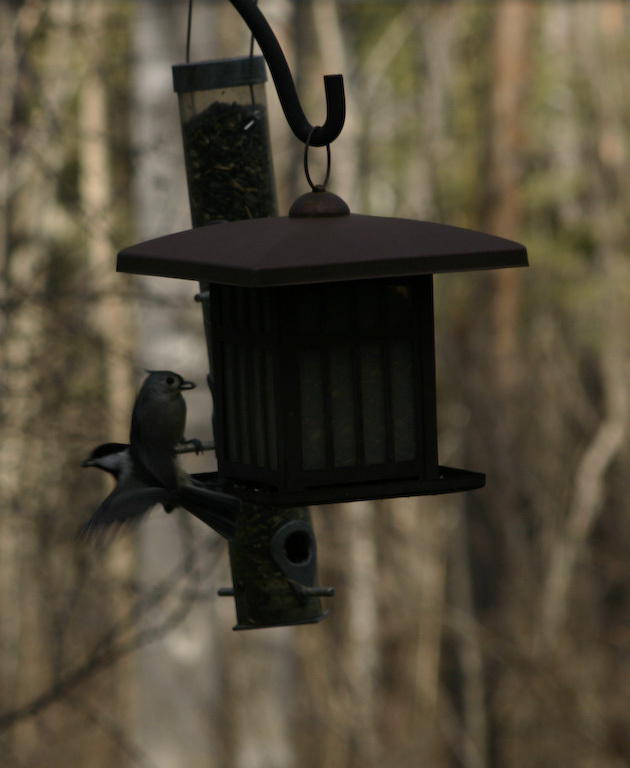 Titmouse and chickadee flying from the feeder. I need to get a better container for my birdseed, and probably some new birdseed while I'm at it. I also need to track down some other feeders in the basement. I don't think I'll get goldfinches in winter, but I've had some beautiful woodpeckers before. Much to my surprise, it's stayed sunny on and off, and we only had a sprinkle of rain. It looks like it'll be staying fairly warm the next couple of days. I also need to figure out swale maintence. The more I walk on the mulch, the more it breaks down and looks like the surrounding dirt. I'm guessing I need to clear them out once in a while and replace the mulch. I also reconnected two low-voltage lights. I'm guessing water got into the connections, froze, and opened the connectors. Unfortunately, I now seem to have half the lights working half the time, and need to figure out what that's about. I probably have a larger connection problem than I realized, and the lines have gotten kind of strange over time as I added lights. The chickens got some seedheads I found, and a few green plants as well. They've been enjoying another day outside. It was great to come home to a winter wonderland of snow, but that pretty much all disappeared last night and today. It's nice to have some warm days, and I hope to fix the lights tomorrow, but it does have a way of revealing things I need to address. The chickens were definitely celebrating, enjoying their outside area for the first time in a while, instead of hiding in the coop. I'm going to wander the pathways tomorrow with a scuffle hoe, hoping kill a lot of the grass that's grown on the mulch in a period when it can't grow back easily. This also reminds me that we got a thermostat for the heater that keeps the chickens' water from freezing, and I should install it, since they don't really need that heat right now. In an aethetic advance for the garden, I managed to hand a lot of the plastic political signs that gathered here off to a friend, for safer storage in his basement. I also found that I had a few more rectangular frames from old signs than I'd thought, and those might be useful as supports for floating row covers someday, probably inside a greenhouse or tunnel. We'll see! I didn't get to my hour for gardening thoughts until about 8:00pm - not exactly the best time for getting out and looking over the garden, something I hope to do in the next couple of days, as we get a thaw. Instead, I spent some time with our catalog box. I meant to focus on seed catalogs, but got distracted by Betterbee, as Angelika would like to put two hives in the front yard in the spring. Like the chickens, there's an up-front investment followed by less intensive maintenance. The bees would require a lot less food from us and can more frequently live off the land. We're trying to make sure we have flowers blooming continuously from as early in spring as possible to as late in fall. Then I got distracted by Growers Supply, mostly for the greenhouses and high tunnels, since I'd been thinking about winter gardening. I have a lot more thinking to do on that angle before I even consider buying anything, and probably some tree removal and a lot of prep work as well. I looked through St.Lawrence Nurseries and Fedco Trees. Fedco Trees had an interesting suggestion for feeding chickens by planting a mulberry tree where the fruit can drop into their yard, something I think I might try. I also put together an initial list of new fruits and vegetables I'd like to make sure I plant. Eating locally since August has given me a different perspective on what I want in the garden, but I have a lot to figure out before I'm ready to plant anything. At least in theory, it's easier to put an hour a day into garden-related projects when you're actually at home. That's usually true, though my head is spinning from jetlag, so I suspect anything I do today will probably cause more harm than good. The one disappointment out there is that something ate most of our kale - what we get for not having the dogs and cats around for three weeks, I guess. I mentioned Gaia's Garden yesterday. I think it's still the key book to read if you want to figure out how exactly this permaculture stuff is supposed to work on a scale that's easy to understand. Josh Dolan loaned me his copy when he first started working on my garden, along with a lot of other books. This was the one that stuck. I returned his copy a long time ago, but over the past few months I kept coming up with ideas I knew I'd seen somewhere but couldn't find again. (Ducks, for instance.) Most of them come from this book, I think. I ordered a copy over the holidays and am happily re-connecting, hoping to get more of those ideas right. It's not too hard to read gardening books on planes, but the timezone change makes it hard to do anything when you get off the plane. We did get back and were happy to find the chickens in their coop, with three eggs as a welcome-home gift. I battled the cat-litter compost (more on that later), and got things into the house, but otherwise all I've managed is to flip through a bit of Gaia's Garden, the first book that made permaculture seem coherent to me. Hopefully I'll be more effective tomorrow. We're flying today, but that's lots of time to read. I'm still reading Four-Season Harvest, while Angelika's exploring Storey's Guide to Raising Rabbits. I'm thinking about vegetables and ducks, while she's thinking about furrier creatures. All of these things, though, are about developing a different kind of garden, one in which animals play a big role. Both our animal and our vegetable ideas are going to mean a lot of construction, as rabbits, ducks, and winter vegetables all need sheltered homes. It's probably a good thing that I've decided to focus an hour a day on the garden. Deliberately starting a gardening year in January is a tricky thing. There's plenty of snow on the ground, plenty of cold in the air. There isn't a whole lot growing - though that's largely because I hadn't planned for anything, except kale, to come through into winter. I've been reading Eliot Coleman's Four-Season Harvest, and that was part of what got me thinking it was time to commit more time to the garden, on a year-round basis. Gardening doesn't have to be a sprint in spring, weeding and watering in summer, and a harvest at the end in autumn before going into hibernation. He seems to be working in the same Zone (5) as our house, with similar days of cold, in a slightly higher latitude. It seems pretty clear that we should be able to make his approaches work in our own northern climate, though I worry that being on the north side of a hill make offset our slight advantage in sunlight. At the outset, I like that he explains a few different approaches, from classic winter root cellaring and forcing through cold frames, greenhouses, and greenhouses with row covers inside. There's also a section on ducks that has me thinking that they might be a nice supplement to the chickens we already have. For this year, I'm guessing that I'll start planning with some of his more exciting ideas in mind, but will probably mostly make sure I leave room to put in a greenhouse rather than build one. I've wanted to build cold frames for a while now, and it's past time to do something about that. After two years of work in the garden without being able to give it the focus it deserves, I'm going to devote an hour a day to the garden this year. That won't always mean being out there digging, but it will mean a much more consistent focus than I've given it so far. For the next few months, I'm guessing it will mostly mean reading, planning, cleaning space in the basement for garden tools and starting plants, and, of course, taking care of our compost accelerators, the chickens. To help keep myself on track, I'll try to publish to this blog every day. I can't promise it'll always be exciting, but hopefully it'll be useful.